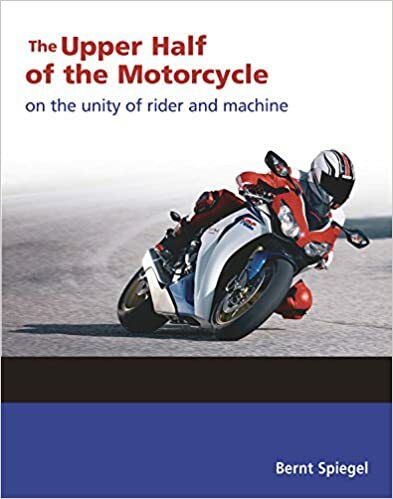 Discussion in 'The Perfect Line and Other Riding Myths' started by ts01, Nov 4, 2018. As a long time cyclist (primarily road) I tried to set aside my old habits and assumptions when I started motorcyling last summer and took the MSF course and watched a gazillion web videos to learn this new thing. Even started reading "Twist of the Wrist" but it seems a bit beyond me. Now that I'm riding more by instinct and not trying (or able) to recall each piece of book learning, I decided to use my old bicyling habits recently and find it helps me corner at a bit higher speeds - specifically, transferring body weight to the outside peg as the bike leans into the turn. Cornering on a road bike, I'd always have the inside pedal up for pedal clearance and the outside pedal down and weighted at the bottom of the crank rotation for stability while leaning (with more weighting on the outside at higher speeds). On the motorcycle, obviously my pegs are stationary but after initiating the countersteer and lean, I feel - or imagine - a similar stabilizing effect by relaxing the inside leg and shifting weight to the outside peg. I don't recall anything to that effect from all my book learning on motorcycling. So am I forgetting it, making it up, or screwing it up? Don't overthink it with book reading. Ride more,read less. R100PDave, Strong Bad, SmittyBlackstone and 1 other person like this. Overthinking this generally not good when new to the sport. MSF BRC is great but I recommend scheduling the Advanced Riders Course as soon as you can. Listen to those guys to get the straight "skinny" on riding a motorcycle closer to the edge. What applies to a bicycle may not apply to a powerful motorcycle. Or a gutless one! What bike is this? And how much do you weigh? If the bike is a 650lb sport touring bike, and the rider is like 160lbs, and you just press a wee bit more on the outside peg, I don't think it is really doing much. Buy hey, if it feels right, no issues to keep doing it. On a trials motorcycle it is a HUGE difference weighting different pegs ... but those are like 180lbs . I have seen some videos of this technique during an ADV offroad type training for bikes like KTM 990s or BMW GSs. The speeds were pretty slow, the rider was standing up. I have done it on bikes like a DR-650 or KTM 640 when on hard packed fireroads and trying to carve corners ... I think it helped. Unless you're moving your body to the outside, you're not putting much weight on the peg. A motorcycle weighs substantially more than a bicycle, your ratio of rider weight to bike weight is significantly less. Iow, it ain't gonna make a whole lot of difference. It is less that you are weighting the outside peg than it is that you are shifting weight inside. Seen it done in bike races all the time. Some even hang off a bit to the inside, off the saddle. Keep riding how ever it works for you. Motorcycle racers didn't really hang off inside too much until the lean angle dictated they do so to preserve clearance and stay on the tread (you know what I mean, stay on the meat of the tire, not riding out onto the sidewall) to maintain traction. Like the man said, ride more and read less. You will develop whatever works for you in a given circumstance. I will hang a knee out, shift weight in on my dual sport when riding hard on pavement and lean the bike in more while staying more upright when riding a bit harder on gravel and dirt. But neither exclusively. Countersteering is virtually automatic no matter which way you corner. After all, if you don't you crash. CRP6001 and SmittyBlackstone like this. As Markk53 says, it is not about attempting to "weight the peg" on this or that peg. It is all about where you position your body weight [in real terms, its mass / center-of-gravity] in relation to the C-o-G of the bike's mass. Where necessary for better clearance, cornering on road, you move your shoulders (and for even greater effect, your hips) to the inside of the corner (relative to the bike's position). Basic physics . . . though it's a bit counterintuitive. Also a bit counterintuitive, is the usefulness of doing the opposite for hard cornering on dirt. Keeping your body mass/c-o-g on the "outside" of the bike allows you to lay the bike over to a steeper angle and gives you the benefit from the tire contact patch becoming more "conical" [sorry, that's probably not the best phrase for it] which aids in turning the bike. Exactly which peg is then carrying "more weight" . . . is immaterial. Indeed, you could be kneeling on the seat, with your boots completely off the pegs . . . just so long as you body is the right distance laterally from the bike. Best to simply move your body, and forget about "peg weighting". The phrase "weight the peg" is really a very misleading one ~ but it has taken on an almost religious significance for some riders, who heard their granpappy/instructor say it . . . and they will argue black-and-blue about whether inside or outside pegs should be "weighted" (without actually thinking it through, on what it's all about). Well specifically a training exercise, preferably a smaller bike or a off road oriented bike, but I found a scooter works well. Start practicing slow speed turns in a circle as slow as you can without putting a foot down on a surface with low traction. Packed dirt works best. Rising slightly off the seat helps 2. Turn both directions, this alone is great practice for slow speed maneuverability on loose surfaces. Get confident on the tight as your bike can circle so slow you need a little clutch to not stall. Now it's time to have fun. With a combination of more throttle and careful clutch control, smooth clutching, start a little spin of the tire. The goal is a smooth controlled slow donut, in such a manner that if you feel the bike over correct or slide too far just slow straighten and ride straight. I've taught this to life time riders in SE Asia, and never once - on scooters - did someone fall. But you learn the feel of a slow speed slide and what you're asking, weight balance gently side to side. I like doing this with any of my off road bikes, and always find it so much easier before practice to turn left. SmittyBlackstone, Suncoaster and CROSSBOLT like this. A lot to think about. Or NOT think about. Either way, thanks. I hadn't really thought much about the shoulder or upper body effect of this peg-weighting idea. Just try to stay loose on the bars after bumping the inside grip to initiate countersteering, and to keep my eyes focused into the turn. Rider = 175 lbs. Bike = CB500X. I just sold a Ninja 500 on which I never really thought about this stuff. Yeah, I don't like the idea of losing traction on the CB500X. But that sounds like fun exercise. Your'e right. For most cornering, you simply countersteer with the bars, as comes naturally for bicycle & motorbike riding. So-called "Body English" movement is reserved for hard cornering. Want proof that it isn't peg weighting - go down the road, stand up, put all your weight on one peg. You can stand there all day and ride down the road. It's where the body weight is "suspended" I guess would be the right term. Have fun riding and play around with weight shifting including sliding off the seat, upper body shift, and even hanging a knee out - it is like fine tuning a bit - as well as bar input. One of my favorites is the centerline slalom, doing about 50-60 mph and weaving between the white centerline when the road is open and clear of any traffic. Another is changing position mid turn, moving in deeper or out wider, through throttle, brake, and weight/steering. Keeps me sharp and it's kinda fun to play. Just don't do it around other traffic, you might freak them out and if one is a LEO you might get pulled over. Racing is historically the biggest driver behind different riding styles over the decades. Maybe start with your upper body. Turn your head and shoulders in the direction of the turn. Lean in the direction of the turn enough so that your head is past the center line of the bike. I think weighting one peg or the other is a bigger thing in dirt riding. What I would try to do is weight both pegs evenly and see what effect that has. On bikes with shocks that have bad damping, it definitely helps me get around. I had an R100/7 with pretty blown shocks and it would wallow a ton. It was only manageable if I got my weight off the seat and onto the pegs (not standing, just as much of my weight on the pegs as I could). Especially if a bike is ever wallowy, this seems to work well for me. Of course you want to grip the bike and tank while you're at it, but lowering your center of gravity that way does seem to help. Also, the higher the seat height, the more this should help, all other things the same. Spending most of my time on dirt bikes, I can tell You that weighting the outside peg is a fundamental skill, just like countersteering. Ride on! 4bikes, Barry and nk14zp like this.